Dunedin is replete with breweries, all within walking distance. At the time of this post, there are SEVEN in the area. Combine that with it’s pedestrian-friendly design and laid-back atmosphere, and it’s the perfect place for a craft beer walking tour. 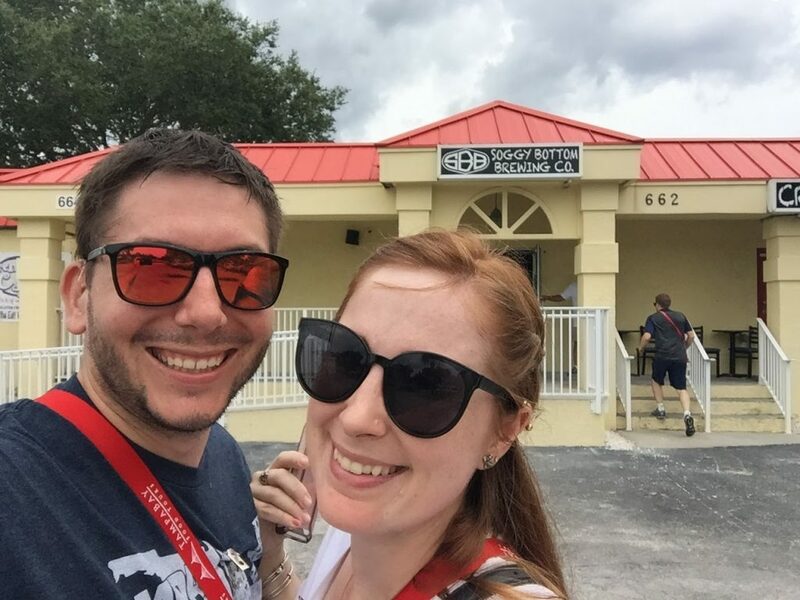 The Dunedin Craft Beer Tour, put on by Tampa Bay Food Tours, is a 3 hour walking tour that takes us to five of those breweries, on a route that was just short of 2 miles. Catering was provided at two of them, from local restaurants. Started by founders Mari White and Kimberly McAvoy, this tour is meant to be small and personal, without interfering with the locals and regulars who frequent these locations, or interrupting the busy work of the brewery staff. To keep things simple, and from getting too rowdy, the participating breweries typically keep the beers limited to two 4-5 oz samples per guest. My wife Beth and I joined the tour on a Sunday. We are regulars to Dunedin, and I have been to every brewery multiple times. But guided by Tim White, Mari’s husband, we took roads we’d never walked before, and we were treated to gorgeous waterfront views, while learning bits of Dunedin history that we never knew. We went first to Dunedin House of Beer (HOB), which has dozens of guest craft beer selections, and about a dozen of their own. We grabbed primarily HOB beers, like the Mango Hefe, Orange Rye Pale, and a Peanut Butter Blonde. Beth loves sours, so we also picked up the Inoculum Aphelion (local brewery up in Brooksville!). Samples in hand, we were taken to the main brewhouse where we learned the basic principles of brewing: Grains meet hot water to form mash, which is filtered out to become wort that is subsequently boiled with hops and fermented to create the beverage we all know and love. Kept on a very tight schedule (and kudos to that), we hopped on over to Cueni Brewing, which provided us with a pre-selected flight of their beers, which included the BJB Blond, McGrady the Mild, and Redheaded Step-child Amber. Owner and Headbrewer Jon Cueni guided us through his choices for core beers. This stop was also our first with food. Sandpiper Cafe provided Cuban sandwiches and chips, which was by far the best Cuban I’ve had since moving to Florida 10 years ago. Next on our agenda was 7venth Sun Brewing, which just expanded to their second location in Seminole Heights. Taking a beer break, we “only” picked up the Gin Barrel Aged Kölsch, and the Passion Sauce Passionfruit Cacao, and we went outside to enjoy the outdoor seating and take a breather from all of the activity. We moved on to Soggy Bottom Brewing, which is one of the youngest breweries on our lineup. They opened within weeks of another upstart, and our final destination on the list: Caledonia Brewing, and both are about halfway towards their one year anniversaries. Both of these breweries have a wide variety of their own selections on tap, as well as guest taps. 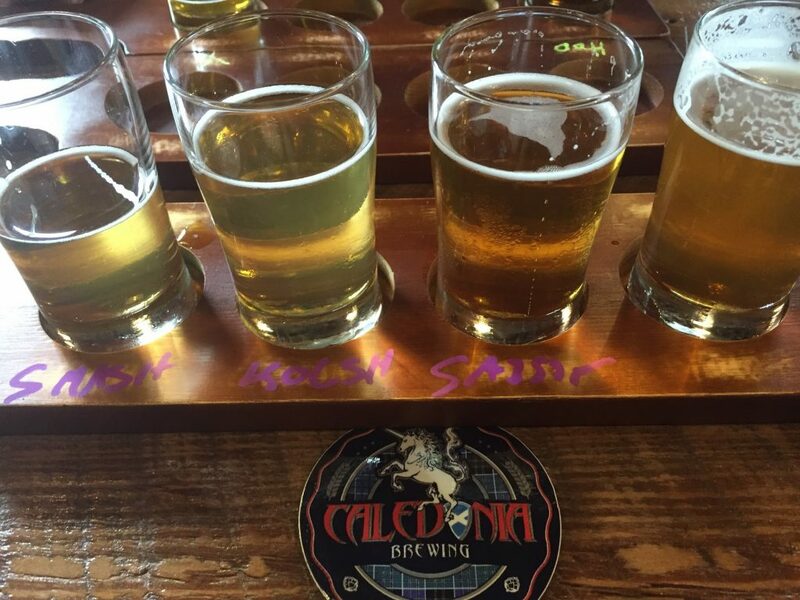 Caledonia brewing provided a full flight of their beers. They were also our second stop with food, this time provided by the Dunedin Smokehouse, which consisted of beef brisket sliders, and fried macaroni balls. We were having such a blast—talking to Kim McAvoy and other people on the tour about what makes the tour work, our overall loves of Dunedin and the region, and all of the delicious brews—I forgot to keep taking notes! But, let’s be honest: that’s a review in itself. We would absolutely recommend this tour to locals and tourists alike. I’ve already recommended the tour to out-of-state friends for the next time they visit. Tampa Bay Food Tours officially begins on Sept 2, with both the Dunedin Craft Beer Tour and a restaurant-centric Dunedin Food and Craft Beer tour. Tours are offered on Saturday and Sunday, and will be introducing more days in the future. They also plan to quickly expand to other cities, including Downtown St Pete. Tickets are $65, and can be purchased online.